Definition at line 21 of file CQSpeciesDetail.h. Definition at line 25 of file CQSpeciesDetail.cpp. References CModelEntity::ASSIGNMENT, CModelEntity::FIXED, FROM_UTF8, CQExpressionWidget::InitialExpression, mItemToType, CModelEntity::ODE, CModelEntity::REACTIONS, CModelEntity::StatusName, and CQExpressionWidget::TransientExpression. Definition at line 66 of file CQSpeciesDetail.cpp. Definition at line 505 of file CQSpeciesDetail.cpp. References CModelExpansion::ElementsMap::add(), CModelExpansion::SetOfModelElements::addCompartment(), CModelExpansion::SetOfModelElements::addMetab(), CCopasiVector< T >::begin(), C_INVALID_INDEX, ListViews::COMPARTMENT, ListViews::DELETE, CModelExpansion::duplicateMetab(), CCopasiVector< T >::end(), FROM_UTF8, CMetab::getCompartment(), CModel::getCompartments(), CModelExpansion::ElementsMap::getDuplicateKey(), CCopasiDataModel::getModel(), CCopasiObject::getObjectName(), ListViews::METABOLITE, CopasiWidget::mKey, mpCurrentCompartment, CopasiWidget::mpDataModel, CopasiWidget::mpListView, mpMetab, pdelete, CopasiWidget::protectedNotify(), ListViews::REACTION, CQNameSelectionDialog::setSelectionList(), and ListViews::switchToOtherWidget(). 521 pDialog->mpSelectionBox->setEditable(false); // at least for now, unless we want to add new compartment creation here. Definition at line 235 of file CQSpeciesDetail.cpp. References load(), CopasiWidget::mpListView, mpMetab, CopasiWidget::mpObject, and ListViews::switchToOtherWidget(). Definition at line 70 of file CQSpeciesDetail.cpp. References CModelEntity::FIXED, mItemToType, CModelEntity::REACTIONS, and save(). Definition at line 251 of file CQSpeciesDetail.cpp. 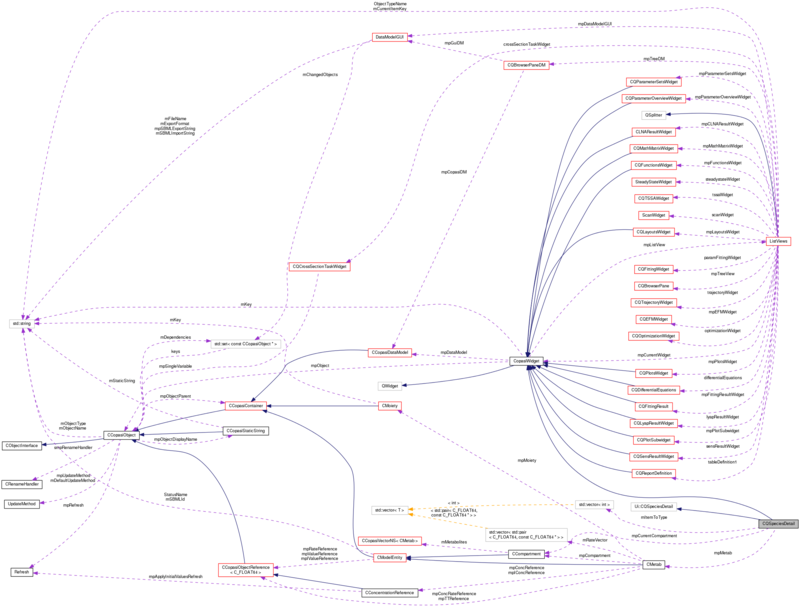 References CModelEntity::ASSIGNMENT, FROM_UTF8, CMetab::getCompartment(), CModel::getCompartments(), CModelEntity::getExpression(), CMetab::getInitialConcentration(), CModelEntity::getInitialExpression(), CModelEntity::getInitialValue(), CMetab::getModel(), CCopasiObject::getObjectName(), CModelEntity::getStatus(), CModel::getTimeUnitsDisplayString(), CMetab::getTransitionTime(), loadReactionTable(), mChanged, CopasiWidget::mFramework, mInitialConcentration, mInitialNumber, mpCurrentCompartment, mpMetab, setFramework(), CCopasiVector< T >::size(), slotTypeChanged(), and CModelEntity::StatusName. Definition at line 440 of file CQSpeciesDetail.cpp. References CModel::appendDependentReactions(), FROM_UTF8, CChemEqInterface::getChemEqString(), CMetab::getDeletedObjects(), CMetab::getModel(), CCopasiObject::getObjectName(), and mpMetab. 468 // Provide count of reactions, in label. Definition at line 333 of file CQSpeciesDetail.cpp. References CModelEntity::ASSIGNMENT, ListViews::CHANGE, CCopasiDataModel::changed(), ListViews::COMPARTMENT, FROM_UTF8, CMetab::getCompartment(), CModel::getCompartments(), CModelEntity::getExpression(), CMetab::getInitialConcentration(), CModelEntity::getInitialExpression(), CModelEntity::getInitialValue(), CMetab::getModel(), CCopasiObject::getObjectName(), CModelEntity::getStatus(), CQMessageBox::information(), CModel::initializeMetabolites(), mChanged, ListViews::METABOLITE, CopasiWidget::mFramework, mInitialConcentration, mInitialNumber, mItemToType, CopasiWidget::mKey, mpCurrentCompartment, CopasiWidget::mpDataModel, mpMetab, CopasiWidget::protectedNotify(), CCopasiVectorN< CType >::remove(), CModel::setCompileFlag(), CModelEntity::setExpression(), CMetab::setInitialConcentration(), CModelEntity::setInitialExpression(), CModelEntity::setInitialValue(), CMetab::setStatus(), slotCompartmentChanged(), and TO_UTF8. 350 msg = "Unable to move species '" + FROM_UTF8(mpMetab->getObjectName()) + "'\n"
351 + "from compartment '" + FROM_UTF8(CompartmentToRemove) + "' to compartment '" + Compartment + "'\n"
Definition at line 135 of file CQSpeciesDetail.cpp. References CModelEntity::ASSIGNMENT, FROM_UTF8, CMetab::getConcentration(), CMetab::getConcentrationRate(), CModel::getConcentrationRateUnitsDisplayString(), CModel::getConcentrationUnitsDisplayString(), CModel::getFrequencyUnitsDisplayString(), CMetab::getModel(), CModelEntity::getRate(), CModelEntity::getStatus(), CModelEntity::getValue(), CMetab::isInitialConcentrationChangeAllowed(), CopasiWidget::mFramework, mInitialConcentration, mInitialNumber, mItemToType, mpMetab, and CopasiWidget::setFramework(). Referenced by load(), and slotTypeChanged(). Definition at line 56 of file CQSpeciesDetail.h. Definition at line 474 of file CQSpeciesDetail.cpp. References CQMessageBox::confirmDelete(), ListViews::DELETE, FROM_UTF8, CMetab::getDeletedObjects(), CMetab::getModel(), CCopasiObject::getObjectName(), ListViews::METABOLITE, CopasiWidget::mKey, mpMetab, CopasiWidget::protectedNotify(), and CModel::removeMetabolite(). 495 protectedNotify(ListViews::METABOLITE, ListViews::DELETE, "");//Refresh all as there may be dependencies. Definition at line 573 of file CQSpeciesDetail.cpp. References ListViews::ADD, C_INVALID_INDEX, CModel::createCompartment(), CModel::createMetabolite(), CModel::getCompartments(), CCopasiRootContainer::getDatamodelList(), CModelEntity::getKey(), CCopasiDataModel::getModel(), leave(), ListViews::METABOLITE, CopasiWidget::mFramework, CopasiWidget::mpListView, mpMetab, CopasiWidget::protectedNotify(), CModelEntity::REACTIONS, CMetab::setInitialConcentration(), CModelEntity::setInitialValue(), CCopasiVector< T >::size(), ListViews::switchToOtherWidget(), and TO_UTF8. Definition at line 615 of file CQSpeciesDetail.cpp. References CModel::getCompartments(), CModelEntity::getInitialValue(), CMetab::getModel(), CopasiWidget::mFramework, mInitialNumber, mpCurrentCompartment, mpMetab, and TO_UTF8. Definition at line 639 of file CQSpeciesDetail.cpp. Definition at line 644 of file CQSpeciesDetail.cpp. Definition at line 649 of file CQSpeciesDetail.cpp. Definition at line 668 of file CQSpeciesDetail.cpp. References CMetab::convertToConcentration(), CMetab::convertToNumber(), CMetab::getModel(), CopasiWidget::mFramework, mInitialConcentration, mInitialNumber, mpCurrentCompartment, and mpMetab. Definition at line 703 of file CQSpeciesDetail.cpp. Definition at line 706 of file CQSpeciesDetail.cpp. References CModel::appendDependentReactions(), C_INT32, C_INVALID_INDEX, CMetab::getDeletedObjects(), CReaction::getKey(), CMetab::getModel(), CCopasiObject::getObjectName(), CopasiWidget::mpListView, mpMetab, ListViews::switchToOtherWidget(), and TO_UTF8. Definition at line 736 of file CQSpeciesDetail.cpp. References CModelEntity::ASSIGNMENT, CModelEntity::FIXED, CopasiWidget::mFramework, mItemToType, CModelEntity::ODE, CModelEntity::REACTIONS, setFramework(), and slotInitialTypeChanged(). 780 // This will update the unit display. 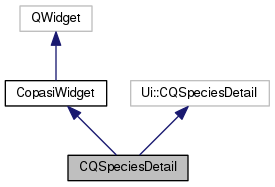 Definition at line 90 of file CQSpeciesDetail.cpp. References ListViews::ADD, ListViews::COMPARTMENT, ListViews::DELETE, load(), ListViews::METABOLITE, CopasiWidget::mIgnoreUpdates, CopasiWidget::mKey, ListViews::MODEL, mpMetab, CopasiWidget::mpObject, and ListViews::STATE. 110 // If the currently displayed metabolite is deleted we need to remove its references. Definition at line 41 of file CQSpeciesDetail.h. Referenced by load(), and save(). Definition at line 47 of file CQSpeciesDetail.h. Definition at line 46 of file CQSpeciesDetail.h. Referenced by load(), save(), setFramework(), and slotInitialValueLostFocus(). Definition at line 48 of file CQSpeciesDetail.h. Definition at line 45 of file CQSpeciesDetail.h. Referenced by load(), save(), setFramework(), slotCompartmentChanged(), and slotInitialValueLostFocus(). Definition at line 44 of file CQSpeciesDetail.h. Referenced by CQSpeciesDetail(), leave(), save(), setFramework(), slotInitialTypeChanged(), and slotTypeChanged(). Definition at line 43 of file CQSpeciesDetail.h. Referenced by copy(), load(), save(), slotCompartmentChanged(), and slotInitialValueLostFocus(). Definition at line 42 of file CQSpeciesDetail.h. Referenced by copy(), enterProtected(), load(), loadReactionTable(), save(), setFramework(), slotBtnDelete(), slotBtnNew(), slotCompartmentChanged(), slotInitialValueLostFocus(), slotSwitchToReaction(), and update().